So today while hanging, I'm retransmitting some infolinks from the first weeks; medical supply requests, the shipping address for OWS at Liberty Plaza, some handy tutorials and official statements from Occupy Wall Street in the INFORMATION section below, plus the usual media roundup. I also decided to feature some of the foreign independent media, loving all the tweets from internationales adding their voices and cities to what's now being spoken of as OccupyEverywhere. The National Lawyer's Guild in NYC: 212-679-6018. *Mr Spock raises eyebrow* "Fascinating." Excellent photo compilation from electronic supporters writing out their stories for the camera. 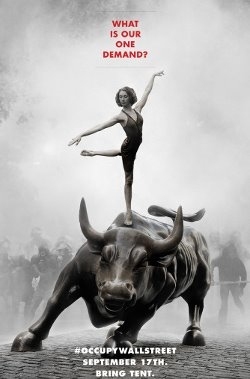 one of the classic OccupyWallStreet pics! This George Carlin video from "Life Is Worth Losing" (2005) gets around constantly. 3 months before OWS, nurses asked WallStreet to pay their fair share too. Excellent example of corporate media spin and semantic warfare. Maybe it's story-envy. Ooooo they talks nasty! But you knew that. But they didn't know what caches are for; now they do. That's why I love the internet; so educational! Russia Times covering #OccupyWallstreet. Wash Post covering Moscow clamp-down on gay rights march. Two-way hypocrisy. Your most lethal weapon is your mind. Keep it peaceful & creative. Dear the Internet, please make it stop raining on #occupywallstreet k thx bye. Sometimes the only difference b/w a hippie and Miss America is a shower and a crown. Don't we all want peace? We've moved from racial profiling to facial profiling in america. Now that's progress. I am so proud of all the protesters! #occupywallstreet and especially like the father and his children=real families fed up! I may not be able to #OccupyWallStreet, but I can take my money out of their banks. Get your money out of Bank of America (or other big banks) and into a regional bank or credit union. I am going to repeat what I said before. I remain skeptical. That doesn't matter. #occupyWallstreet can teach us much. when the government bails out corporations and provides them with special treatment...that fascism, not capitalism. Volg dit, de media doen het niet! RT @OccupyWallSt Two weeks strong! Our third week will only be stronger! Vel, som #OccupyWallStreet nå viser, litt "kommunisme" er ingen dum ting. Vi trenger regler som forhindrer plutokratene. Noam Chomsky Anuncia Solidariedade com #occupywallstreet - Portal Vermelho: http://t.co/l3xso9iX via @AddThis 'Precariato' vai à luta. MS: This is a hostage situation. Gamblers are holding America hostage. Negotiators urgently needed. BACK: @misosusanowa I love me some Dorothy Parker! @GirlScouts Y U No #occupywallstreet? WE LOVE YOU. PLS BRING THIN MINTS. [to a fellow troll-hunter] @trollhunter *slow clap* well played, sir! Well played! [got tired of all the "wtf" tweets and sent this out]: WHAT THE HECK IS OCCUPY WALL STREET? LMGTFY - Wikipedia: bit.ly/n8BnCX . You're welcome. RT @TROLL: When you #OccupyWallStreet and complain about huge corporations be sure to tweet about it on your expensive cell phone. MS: @TROLL2: sure, no problem; do you know any good cuneiform chiselers? +1 troll. MS: @troll first you must disconnect the vampire from his victim in order to drain his power. MS: @troll so sorry your metaphor processing lobe is on the fritz. Stay trollin!